This is the hardest exemplar essay I have written so far - because the essay title invites the student to evaluate ‘the usefulness of structural approaches to our understanding of families and households’ . The temptation with this essay is to try to cover the functionalist, Marxist, feminist and personal life perspectives on familes and evaluate them all! This is not realistic in 30 minutes in the exam (which is the time students should allow for a 20 mark essay). This essay title is therefore a good opportunity to get students to think about how they will select enough material for BREADTH in the essay - but not TOO much to alloow enough time to develop and analyse points to ensure there is enough DEPTH. They might want to spot what I have and haven’t included in the essay…and think about which points I have developed for depth. Students need to be reminded to get the balance right. They must ensure they FINISH an essay in 30 minutes in the exam. Half an essay developed in great depth will gain them LESS marks than a completed essay with a broader brush approach. At the beginning of Year 12 Students need to be taught how to write ‘A’ Level standard essays specific to subject and exam board criteria. Sometimes it is useful for students to study an example of how it should be done! I got students to write their own version of this essay first. Then I showed them my exemplar. They marked my version according to the criteria on the assessment sheet (attached) and then marked their own in the same way. By using the assessment criteria students should be able to identify all the elements required in an ‘A’ Level standard Sociology essay - they can see how to reference Sociologists and their research, how to reference the item, how to create an argument, how to evaluate, how to introduce and conclude an essay at this level. I use the self/peer assessment sheet with every essay students write in Year 12 and Year 13, so they are in no doubt how to structure them and how to ensure a decent grade. 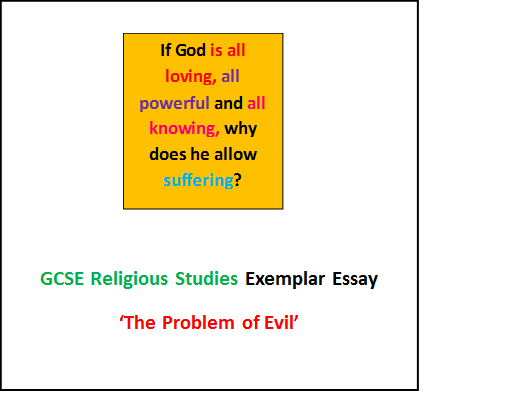 This is an exmplar essay I have written for GCSE Religious Studies students in response to the title ‘The existence of evil and suffering proves there is no God’. This resource includes a copy of the essay and a success criteria chart at the end. Students can read the essay and identify each of the success criteria by highlighting evidence for them in different colours in the main body of the essay. By the end of this task students should be able to see how to compose an essay according to the marking criteria and identify the following: References to scripture, sacred writings or other religious texts. May also include references to philosophers and quotes from religious leaders or well-known believers. Reasoned arguments in support of the statement Reasoned arguments to support a different point of view Reaches a justified conclusion Refers to non-religious arguments (optional) Develops points with evidence and explanation (PEE) Uses subject specific vocabulary and/or key terms accurately Refers back to the title at several points during the essay At the end of the sheet students are asked to write an essay with a different title but that requires similar content; ‘If God were all loving, there would be no suffering in the world’. They are then asked to review their own essay with the same version of the success criterai chart used at the end of the exemplar essay. Not far into Year 12 and certainly in the run up to the first round of exams A Level Sociology students start to ask about how they are supposed to remember names of specific Sociologists to reference in their essays. This activity aims to help students begin to memorise key Sociologists and their research in relation to the ‘Childhood’ sub topic in ‘Families and Households’. Using the Napier Press textbook (which I think is by far the best textbook) students select 10 key Sociologists from the ‘Childhood’ chapter - think of a picture that will help them to remember their name e.g. Jane Pilcher - picture of a pilchard, Ruth Benedict - picture of eggs Benedict. Students create one PPT slide per Sociologist - include their name, date of their work, picture to help remember their name and up to 5 ‘trigger’ words or phrases that relate to the Sociologists work. When printed out as 2 slides per A4 sheet they come out perfect revision card size. The PPT attached has 10 completed slides/cards to use as a stimulus for students OR as reference for the teacher OR for students to compare to when they have made their own…depending on how you want to use them. 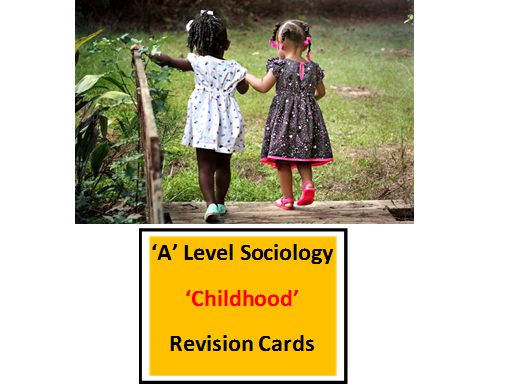 The final slide just has the ten pictures on - which students can use to see if they can use just the pictures to ‘trigger’ in their memory the names of the Sociologists and key things about their research once they have completed their cards.